This is the removal of an abnormal growth on the skin, called a lesion, for medical or cosmetic reasons. 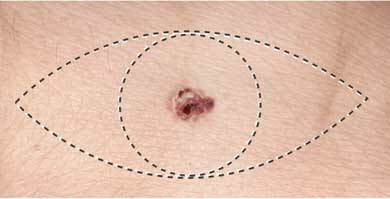 Skin lesions can include warts , moles , cancers, and skin tags. Mohs micrographic surgery—This is used to examine suspected cancerous lesions. Small pieces of tissue are successively removed and then viewed microscopically for signs of cancer . The goal is to get all the cancer tissue and leave as much healthy tissue as possible. Diagnostic tests for skin disorders. Merck Manual Professional Version website. Available at: http://www.merckmanuals.com/professional/dermatologic-disorders/approach-to-the-dermatologic-patient/diagnostic-tests-for-skin-disorders. Updated June 2016. Accessed September 5, 2017.